H2H Movers Chicago Get An Award! Here at H2H Movers we have always had one goal – provide the best possible service at an affordable price. We want to help as many people as possible with our moving services, and this year we have been extremely successful in our efforts. Because of all this, we are proud to say that we have managed to score yet another award for excellent customer service. 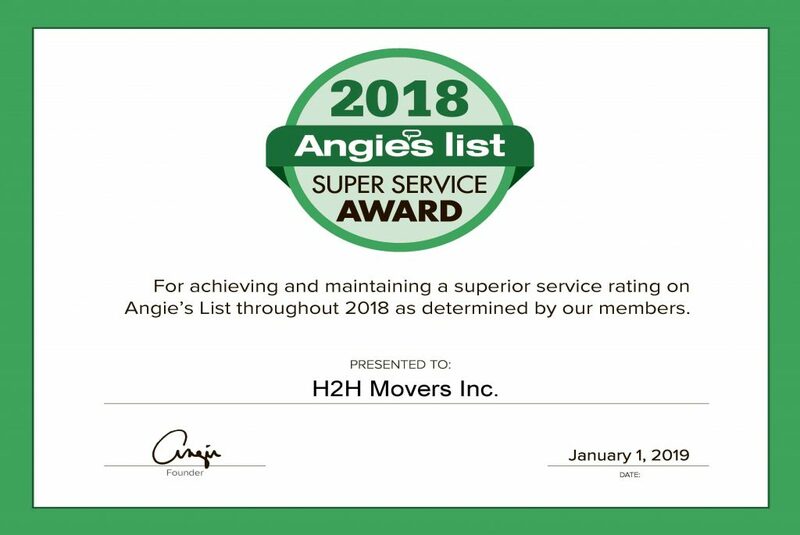 This time around we got the 2018 Angie’s List Super Service Award! This means a lot to us, because it goes to show how great our dedication is. And what is more, people are noticing this. To celebrate our award, we decided to write about something different today. While we are always keen on bringing you quality moving advice, now we will share what has helped us reach such success with our clients. Remember – we owe this to you, as you are the ones who make our business go even further. We will continue on delivering the best services possible! There is something special about helping others. Even if it is a business (so you charge money for the service), you cannot go far if you do not have genuine interest in the wellbeing of other people. Moving may be a rather trivial thing for most folks, but to us it is a way to help and bring value into the community. Because of our goals we always want our employees to be at their best in terms of behavior. A friendly smile goes a long way, this is what we believe. And people have told us that it really matters. Our workers always treat others with respect, because this is how we treat them. It starts from the top and goes all the way down to our newest employee. Having a friendly attitude is great, there is no doubt about that. But even the best attitude would not be worth much, if we did not actually deliver quality of service. Well, we do, and we excel at it! We pride ourselves to be one of the best moving companies in Chicago. Even if we are not the biggest company in the city, we are trying to provide the best services both in terms of value and in terms of quality. As such we always invest in our business by training our Chicago movers and helping them become even better at their line of work. Here at H2H Movers we also look for ways to expand our reach. At first we only had one truck and offered basic moving services. Then we began specializing in packing as well. We soon started learning more about furniture disassembling and assembling. All of a sudden we had a full plethora of services, which made people trust us even more. We believe these are the keys that have helped us become as successful as we are today. Of course, all of that is because clients have been trusting us since the beginning. And we are thankful for that. In a way this award is yours as much as it is ours!